1. Preheat the oven to 200˚C, gas mark 6. In a large roasting tin, toss the red onion with the fennel seeds and 2 tbsp olive oil. Season, spread out well and roast for 35-40 minutes, stirring once, until browned and soft. 2. Meanwhile, put the barley in a medium saucepan with a generous pinch of salt; cover with cool, salted water and a lid. Bring to the boil, then reduce the heat to a gentle simmer. Partially uncover and leave to cook for 25-30 minutes, until the grains are just tender (they should still be chewy). Drain and set aside. 3. 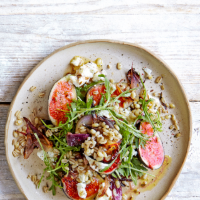 Spoon the red onions (reserving the tin with the juices) onto a large serving platter with the figs, feta, rocket and cooked barley. Toss gently to combine.